Nokia 1202 Discover the power of simplicity, it's a slim, durable, and user-friendly handset. - Design; slim and compact handset fits comfortably in your pocket and has a robust casing designed for everyday use. - Ease of use; Enjoy hassle-free communication on the go with the large keymat, convenient shortcut keys, and user-friendly menu. - Messaging; Choose an alternative way to get your message across by sending an SMS to those close to you. - PIM; Keep on top of your busy life with the built-in calender, calculator, digital alarm clock, and phonebook. 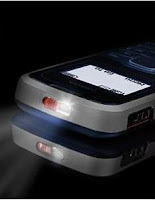 - Flashlight; See what you're doing in the dark by simply turning your device into a handly flashlight. * Call duration recorded and shown when a call is ended and there are history records for each call in call log list. * Menu, phone book view are supported during the call by pressing "Option"